For several years now, the Foundation Stone Meditation has been the focus of our work. The practice of the soul, which learns to experience itself more and more as a threefold being in its connection with the cosmos, is a central motif forming and sustaining the Anthroposophical Society. In the coming year we would like to continue deepening the work, focusing once again on the second verse. This time we will explore exercises of spiritual contemplation leading into meditation. Wolfgang Tomaschitz, General Secretary of Austria, and Jaap Sijmons, General Secretary of the Netherlands, have written two texts which provide suggestions in this direction. In the following issues of Anthroposophy worldwide you will find further contributions on the theme, which can serve as inspiration for the work in your Societies, Branches and Groups. As recommended reading we suggest Rudolf Steiner’s ‘The Christmas Conference for the Foundation of the General Anthroposophical Society 1923/24’, CW 260. The possibilities of a meditative approach to our living with the Foundation Stone Meditation are manifold. Often the reflection on a word or a line can open wide horizons. Here an attempt of such an possible exercise is described. One of the many aspects of the middle verse of the Foundation Stone Meditation has to do with the way we experience time. The verse can lead into a more vivid experience of time than is usually accessible to everyday consciousness and in this experience dissolve the very strong forces which in our time, as Rudolf Steiner once said, reject “what intends to come into our souls from the future”. As a first step one reflects on the very limited possibilities of our everyday consciousness with regard to the future. This is completely dark from the point of view of everyday consciousness. We simply don’t know what the next minutes, the next hour, the day tomorrow, etc. will bring. We can only expect the future. As Rudolf Steiner has repeatedly pointed out, this situation is constitutive for our everyday understanding of ourselves and the world, and the involuntary reaction to it is fear. A fear of the unknown, the unpredictable which, as Rudolf Steiner once said, not without humour, we carry in us as an underlying mood as “surefootedness of our lives”. If one does not simply follow involuntary emotions but takes one’s feelings in hand a little in this experience, the result of such reflection can be condensed into a positive mood. For example, the mood that the future is radically open in the fullness of its possibilities. In a second step, this result can now be supplemented by an image. The image of the rising sun in whose fire nothing of the coming day has yet taken shape. This should be the accent of the second step: the image of the warming sun symbolizing an as yet unshaped future, into which we can venture because it is not alien, but has something in store for us. It is as if it wants to make something out of us. This is how one could describe the meaning that arises meditatively from the interplay of reflection and imagination. The mood is no longer anxious, but confidently anticipating, surrendered to “letting oneself be taught by reality”. In a third step what has been established meditatively can now be accentuated and deepened by the addition of a line from the middle part of the Foundation Stone Verse: “Let there be fired from the East what through the West is formed”. Now the meditative event gets a stronger traction into the essential being, it becomes possible to voice a request. The future is no longer only open, but is experienced as something of purpose, as a conversation of the still formless with that which takes shape and gives shape. From here numerous further perspectives of experience, but also new questions can open up regarding my being woven into this conversation, in relation to the powers of the East and the West in me, regarding the Michaelic experience of qualitative time. The interplay of reflection, image and verse can be described as a meditative practice in which the meaning of the verse is brought into the realm of soul experience and at the same time the experience is guided and illuminated by the verse. Thus, in the soul a path of practice from thought, image and word rounds itself off. This path would not exist if a living light is not cast into the soul from the spirit, which is caught as imagination or shadowed into thought. We encounter the essential at every step, even if we are not aware of it. Full of hope we live towards the sun. Where does this strengthening anticipation of the light and warmth of the rising sun come from? Here we are referred to an opposite experience, that of the sunset and the night. From where do we find the way through the night? Let us look at the process of waking. We emerge with our consciousness from the lack of light and images and turn towards the sun. If unprepared, this gaze can hardly be penetrated. Let us reflect upon the fact that what we feel so strongly as the insecurity of the open future that lies ahead of us, we do not feel in the same way regarding what the night brings us every morning, nor about what lies behind us. We feel the power of incarnation. It comes out of the limbs through which our ego organization and the astral body enter our physical and etheric bodies. Rudolf Steiner gives an imagination to feel ourselves into the spiritual reality. We should think to ourselves, behind the golden sunshine in the day sky, there work the beings of the second hierarchy. We were with them in the night. This is the image of the sun at midnight, appearing behind the earth, because we followed the course of the sun from its disappearance in the evening light and its appearance in bluish reddish glow in the night. Morally the sun makes an impression on us, becoming ever more essential in its beingness. These are the hierarchies we encounter in the night sun. We experience, or remember, in the night all our previous incarnations and dive back again into our present ones. The hierarchies also look back on our previous earth lives and show us in the world of the sun during the day what we are may see of our karma in the visible world, this ‘storeroom’ for the demonstrations in karma on the part of the gods’. Thus we live in trust with the sun, because we feel in our souls that we may expect what will come to us from the hierarchies and what we have already experienced in the night. We come into a soul equilibrium when we feel that the rhythms of day and night let us experience the meaning of our earthly existence. Perhaps we can hear this in the words of the Foundation Stone Verse: ‘For Christ’s will prevails in the surrounding world, in the rhythms of the world, blessing souls’. The sunrise and the memory of the sun at midnight become for us the image of the pure essence of time in the soul, in the heart and in the head, into which the sun can rise through our moral impulses from the night. About the meditative weight of the Imagination of the Rising Sun not much needs to be said; Rudolf Steiner’s references range from Knowledge of Higher Worlds to the “Leading Thoughts.” Perhaps less conscious is the connection between warmth and time experience, as indicated in the line “The blessing of love, it warms the times, to summon the revelation of all worlds” from Benedictus’s meditation for Johannes in the third scene of the first mystery drama. GA 236, Lecture 27th June 1924, Dornach. GA 236, Lecture 22nd June 1924, Dornach. NOTE: new contributions to the annual theme/motif work are added below as they are published in Anthroposophy Worldwide. It has long become a tradition that the Executive Council publishes an annual theme as a proposal for the anthroposophical branches and groups worldwide to work on. This proposal has also always extended to a recommendation of texts or lectures that were suitable for joint studies. A new approach has now been decided on. For some time now we have been trying, together with the Conference of General Secretaries, to choose themes that meet with as broad an interest as possible in the various countries and on the various continents. Since the Goetheanum Leadership was formed in 2012, we have endeavored to look more at the needs, interests, and questions of the various areas where anthroposophy is applied in practice, and of the different Sections within the School of Spiritual Science. It is, after all, important that the whole anthroposophical movement has the possibility to join into creating a deepening and inner orientation for our time that extends beyond the differences between the global regions and professional domains. There will probably not be one particular spiritual-scientific theme that will interest all anthroposophically inspired people in the world to the same extent. Anthroposophy in itself could be such a theme, of course – but that would be too comprehensive and multi-layered a task, and there would still be a need for identifying a focus or motif on the basis of which a stronger spiritual community could grow. With the Goetheanum World Conference at Michaelmas 2016 we have made the Foundation Stone Meditation a central theme. In its form and content, this meditation comprises everything that is essential for the structure and development of the Anthroposophical Society and the School of Spiritual Science. Over and above that, it can yield a wealth of inspirations for joint and individual study. The Foundation Stone Meditation has been translated into many languages and can help us to prepare ourselves, whilst connecting with its origin, for the centenary of the Christmas Conference of 1923–24. We therefore decided in November 2017 at the Conference of General Secretaries to make the Foundation Stone Meditation, up until 2023-24, the center of our joint anthroposophical work. However, we will not, and cannot, prescribe how people are to work on this Meditation in their various locations and groups. People have had so many different traditions and experiences with it – in the Netherlands, for instance, it has a tradition that has been cultivated by many people and groups for decades; in New Zealand it might not be known to some members of the Society – but wherever people are, they can discover and develop new ways of finding something in this wonderful meditation that will connect them. And this is the essence of what we would like to propose this year with regard to the annual theme: Can you – individually or in your group, at home or at work – consider ways of reflecting on the Foundation Stone Meditation together. We will therefore not provide a particular theme but rather invite you to work with us on finding ways of connecting Rudolf Steiner’s gift to, and the intentions associated with it, with our particular situation at this moment in time. Could this work, in the coming years, grow into a motif with which as many people as possible will actively seek to unite themselves? Can we inspire people – be it in anthroposophical institutions and other professional contexts, branches, study groups or Sections – to feel they wish to share this profound anthroposophical substance with us? And can we tell each other about our experiences? We hope that the annual theme we have had so far can become a motif that will enable greater awareness, inner cohesion and warmth for the anthroposophically inspired work across the world and across the diverse spheres of activity. What we focus on within this general motif can change from year to year. Following the Meditation’s inherent structure, we began in 2017–18 with the first part that speaks of practising Spirit Recalling. For 2018–19 we would like to suggest that we concentrate on part two, in which the heart, time, the practice of Spirit Contemplation, the connection of one’s own ‹I› with the cosmic ‹I›, and the feeling take pride of place. The macrocosmic verses of the second part bring us close to the cosmic rhythms, the Christ being and the spiritual beings of the second hierarchy. We invite you warmly to tell us about your attempts and experiences or to send us any work on the Foundation Stone Meditation you have found particularly inspirational. Within the Conference of General Secretaries, Ingrid Reistad (no), Sue Simpson (nz), Arie van Ameringen (ca) and Jaap Sijmons (nl) have offered to commit themselves to this process, and in the Goetheanum Leadership, Christiane Haid and myself have been given the task to give particular consideration to the development of an annual motif. The second verse of the Foundation Stone Meditation is at the centre of the Anthroposophical Society’s new working year (Anthroposophy Worldwide 3/2018). This verse refers us to the human middle, the feeling and the element of time, and it is related to the Christ being. Up until Christmas 2018, various authors will make contributions regarding the «rhythms» of the Foundation Stone Meditation which were developed by Rudolf Steiner. This is how the initiative group in charge would like to prepare the 2018 Christmas Conference on the «Foundation Stone Meditation as a transformative force for the individual and the Society» (in German and English). The second verse of the Foundation Stone Meditation takes us into the element of rhythm and movement. Living in rhythm, we find ourselves placed into a wider cosmic context described by Rudolf Steiner as the «wonderful enigma prevailing between the lungs and the heart». What happens within us, microcosmically, has its equivalent in the macrocosm, where we experience «how the cosmic rhythms are active through the millennia, through the aeons of time, how they powerfully enter into the rhythm of our pulse and blood and awaken in us an ensouled experience of the world.»  The number of breaths we take in a day (around 25,920) corresponds to the number of years of one great solar cycle in the Platonic world year. What an exciting thought – that as we breathe we resonate with the rhythms of the cosmos and that we are even enlivened by these rhythms! In the cosmic rhythms «the Christ will encircling us holds sway». It is this will that bestows grace on our souls and creates life out of death. It loosens from the west the formative forces that have become rigid and enkindles the souls and spirits from the east. Rudolf Steiner advised to work with the Foundation Stone Meditation by focusing on a different line or passage every day of the week. He speaks of ‹rhythms›, meaning that we emphasize individual elements by separating them from their wider context; of short contemplations which he began to present on the second day of the Christmas Foundation Conference. Based on the rhythmic element, we can therefore interpret the rhythms as a culture of practising inspired by the second verse. The altogether seven ‹rhythms› correspond to the seven days of the week and have therefore also a connection with the planetary forces. We can compare them to pathways which lead to the same sanctuary but present each a different view of the whole. As we practise, we experience increasingly how all of anthroposophy is condensed in this meditation as one organism. The rhythmic element also relates to Michael, the spirit of our time, who has «made the rhythmic world his habitation». The verse can then become a living organism in your soul. This is an important process, because it means that we can integrate the Foundation Stone Meditation – which resounded from the Cosmic Word and therefore originates in a realm outside of time – into the stream of time through our daily changing practice. The first Foundation Stone rhythm was given on a Wednesday, the day of Mercury. It opens the round of seven rhythms. The words chosen here are fundamental and simple; they are taken from the first part of the first three verses (see illustration above). The illustration reveals at a glance that it can be read in two directions: horizontally or vertically. Depending on the direction I choose, I pursue a different meaning. If I read horizontally my thoughts focus on the three appeals to practise spirit recalling, spirit awareness and spirit beholding. I can ponder on the qualities expressed by the three attributes added to the noun «spirit» – recalling, awareness, beholding. The preceding noun – «spirit» – gives me the direction I am meant to move in with the three activities. We notice that it needs inner activity to make the individual words reveal themselves to our soul in a way that lies outside our everyday understanding. We need to question the concepts we have already formed of the individual words and transform them into silent, expectant reflection. How can I engender a soul mood of humble expectation that is so subtle and receptive that it can receive the word and allow it to reveal its essence to me? No previous knowledge or understanding should bar the way, but there should only be an openness to listen for what strives to speak within me. Then I can experience how the comprehension of the word, which occurs primarily within myself, is gradually transformed into something higher, which I receive out of the periphery, more out of element of sound. The inner gestures of the words Recalling, Awareness, Beholding can be experienced. Recalling implies a resorting to my inner experience. In conjunction with the word ‹spirit› it raises me above my personal memories and places me into a much wider context. Awareness requires me to pause in a stream that is rushing forward. Something is made to stop and questioned as to its essence. If it is joined to the word ‹spirit› we hear something like a call: Soul, be aware of the spirit! The third appeal speaks to me as a beholder, opening up the possibility of beholding the spirit, an activity that, «in stillness of thought», provides a view of the «gods’ eternal aims». We come to the centre of this rhythm – the ‹I›. This motif now comes towards us, like an echo of the three appeals to practise. Three times your «own I» is mentioned as if the soul needed particular confirmation that «your own ‹I›» is really meant. The ‹I› now enters into three kinds of relationship which are more clearly defined by the three verbs. First we experience an aspect of time in the three relationships. «Your own ‹I› in the ‹I› of God comes into being » refers to our origin, the act of creation, our coming from the past. If your «own ‹I›» is to unite with the «I of the World», some kind of activity is required. We look to the future when on our own ‹I› is bestowed, as a gift out of the deepening stillness of thought, «the light of cosmic being for free and active willing». Again, as in the first verse, the divine touch can be experienced. Let us, lastly, look at the qualities of the verbs, by trying to think and feel their meaning. 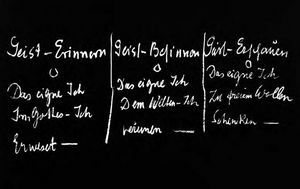 The verb in the first verse is «erweset» in the original German: a new word formation by Rudolf Steiner which signifies coming into being. The prefix «er-» implies a looking back, in this case to the act of creation through the Father. The second verb, unite («vereinen» in German) is, rather surprisingly, not spelt with a capital on this blackboard. Two beings that were originally divided are united, made into one: your own ‹I› and the ‹I› of the World. If we were not aware of the Meditation in its entirety, we might derive from the dynamic of the three verbs that the third step, which follows after the uniting with a being, implied that «your own ‹I›» was bestowing a gift – because in Steiner’s illustration of the rhythm the subject case is used, not the object case as in the Meditation itself (in German «das eigene Ich» rather than «dem eigenen Ich»: «your own ‹I›» rather than «on your own ‹I›»). 1. Rudolf Steiner: Die Weihnachtstagung zur Begründung der Allgemeinen Anthroposophischen Gesellschaft 1923/24 (GA 260), Dornach 1985, p. 62. 2. For more details cf. Hermann Poppelbaum: Beiträge zum Verstehen der Grundsteinsprüche 1923, in: Sergei O. Prokofieff (ed): Die Grundsteinmeditation als Schulungsweg. Das Wirken der Weihnachtstagung in 80 Jahren, Dornach 2017, p. 62. 3. Rudolf Steiner: Anthroposophische Leitsätze. Wo ist der Mensch als denkendes und sich erinnerndes Wesen? (ga 26), Dornach 1962, p. 222. In one of the next issues of Anthroposophy Worldwide there will be a contribution on the connection between the Foundation Stone Meditation and a future Michael Festival. 4. Rudolf Steiner: Die Weihnachtstagung zur Begründung der Allgemeinen Anthroposophischen Gesellschaft 1923/24 (GA 260), Dornach 1985, p. 95.